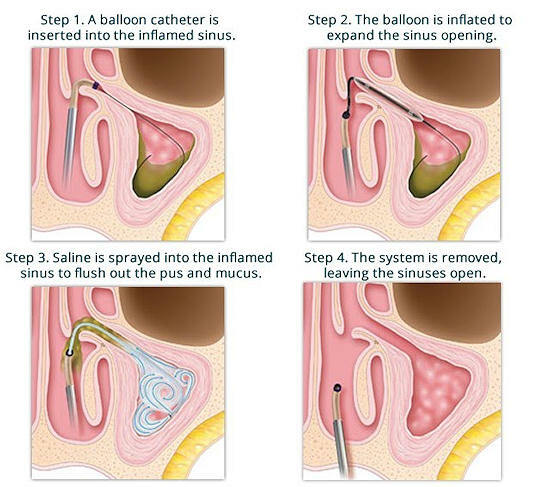 This is an office procedure using a balloon catheter to open the sinus passages, which provides relief for chronic sinus patients, without the need for sinus surgery. Starting in 2001 with a little innovation and positive patient feedback, Shea ENT found that a simple balloon catheter placed in a sinus passage allowed complete resolution of sinus problems! Entellus® balloon catheter device provides superior dilation; Entellus® is used exclusively for our patients. Shea ENT is happy to provide in-office Balloon Sinuplasty, performed with sedation and local anesthesia. Results are long term, and similar to results of standard endoscopic sinus surgery performed in an operating room, with a general anesthetic. Sinusitis can produce chronic facial pressure and pain, and can adversely impact the well-being and quality of life. Sinusitis is a common condition that affects nearly 40 million people each year, making it one of the most common health problems in the U.S. This remarkable sinusitis treatment requires minimal recovery time; for example, the procedure can be done on a Thursday, and return to regular activities by the following Sunday or Monday. This treatment is performed in place of more invasive and aggressive surgeries that involve general anesthesia with lengthy recovery of up to two weeks. Most health insurance companies will cover all or part of Balloon Sinuplasty cost. When performing balloon sinuplasty, Dr. Shea will insert a catheter through the nose into the targeted sinus passage, with light transmission and illumination that will helps ensure correct placement of the catheter. Once positioning is confirmed, the balloon is inflated to open the narrow or blocked passage. Simple: minimal discomfort / bleeding. Local Anesthesia: In–Office Balloon Sinuplasty is an option for patients who decline or are ineligible for general anesthesia. Dr. Shea has done the procedure on people in their 80’s without incident. Only topical anesthetic is required in most cases, and most patients report little discomfort. Fast Recovery: Minimal recovery time with In–Office Balloon Sinuplasty. Many patients are able to return to work after 24 - 48 hours. Comfortable Surroundings: Experience the procedure in a large reclining chair listening to your favorite music, rather than being unconscious under a general anesthetic in an operating room and afterwards being monitored in a recovery room. High Patient Satisfaction: Patients who havehad Balloon Sinuplasty by Dr. Shea have recommended the procedure to family and friends. Potential for Significant Cost Savings: Eligible patients may have lower out-of-pocket costs, as the procedure is performed in a physician’s office, instead of an operating room. In–Office Balloon Sinuplasty performed by Dr. Shea represents a marked improvement over traditional sinus surgery, whichis performed with general anesthesia and involve a longer recovery with more postoperative care requirements. However, while the in-office Balloon Sinuplasty procedure can be an exceptionally effective way to clear sinuses for many patients, Dr. Shea points out that it is not necessarily the right choice for everyone and therefore a comprehensive evaluation is performed prior to any procedure. Typically this involves thorough past medical history, physical exam, and review of Sinus CT scan. Most patients diagnosed with chronic sinusitis who are not responding well to medications are candidates for sinus surgery with the balloon catheter technology. Dr Shea and his surgical assistants have had decades of experience evaluating and treating patients suffering from chronic sinusitis. This team effort is critical in successful outcomes. The use of Balloon Sinuplasty has helped retain the success rate of traditional sinus surgery, while using this simple yet technologically advanced procedure. For questions regarding Balloon Sinuplasty, traditional sinus surgery, andchronic sinusitis, or any other ear, nose and throat concern, please do not hesitate to contact Dr. Shea’s office.